It’s Good Friday, a public holiday here in Ghana and another sunny day. We just went for a walk in the neighbourhood. Actually we just meant to go to the bakery nearby, we overlook their backyard and they were cooking something that smells amazing: goat pepper stew, and maybe jollof rice? They have cooked lunches some days. But the bakery itself was closed, so we went for a slow amble nearby. We met this goat at the 233 Jazz club, and even managed to buy phone scratch cards in a tiny shack of a shop. Success! Yesterday was a big football day: the Black Stars of Ghana played the Mambas of Mozambique, at the Accra Sports Stadium. It ended 3-1 in favour of Ghana. The national football team stays at the hotel next door when they are in town, so we heard the cheers as they arrived last night. Here they are heading off this morning. I had vague plans of an overnight trip to Cape Coast over Easter, but after a long week of power cuts, increasingly bad Internet and intermittent (then no) running water one day at work, I just wanted to stay home and enjoy some modern comforts. The rainy season is starting, and it is going to get worse, my colleagues say. So a little apple cake and iced tea here feels wonderfully luxurious — not to mention having a toilet that flushes! Use a 24 cm baking tin, with baking parchment in base. Whisk eggs and sugar, add softened butter, and stir in rest. 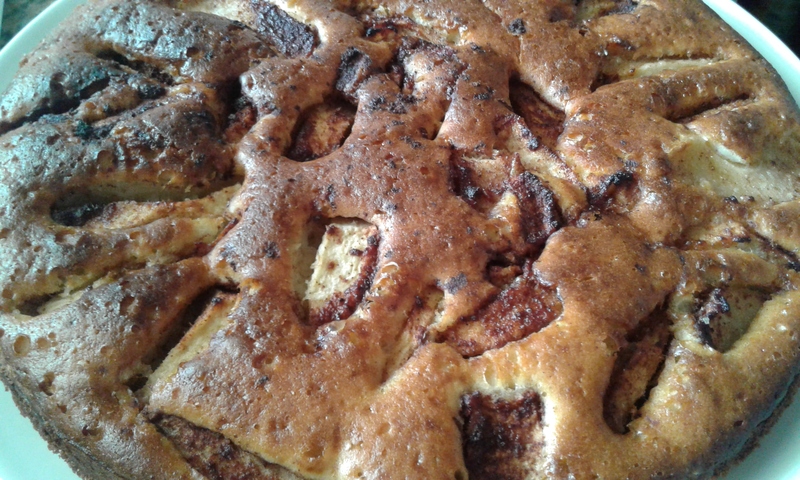 Toss apple slices with sugar and cinnamon, bake at 200C for 35 minutes or so. Cool slightly. Serve with ice-cream, if you have some. Notes: this was slightly overbooked but good. And one nice surprise is OK ice-cream here, though it has often melted and been re-frozen. It is a challenge to get ice-cream home when it’s a really hot day (every day is hot), so I have plans to try making some at home with a powdered milk base and fresh fruit. This entry was posted in baking, food, fruit, Ghana and tagged apples, cake, living in Accra on March 25, 2016 by krumkaker. Yesterday I got slightly lost, coming back to North Ridge from Osu. I’d walked over along the Ring Road on side footpaths to The Great Wall supermarket, a small but well-stocked Chinese store that has good fresh tofu, and a good selection of greens: bok choi, water spinach, plain spinach. 1.30 cedi per square of tofu, about 33 US cents. Optimistically, I thought I’d walk back as well, it’s only 20-25 minutes – unless you get lost, which I did, not good in heat and 85% humidity. I called my husband, and we worked out I was (not easy when street signs and maps do not match, but we went by landmarks). I was just two streets from home, which helped. That is when I spotted these two goats in this driveway. Happy goats, by the look of it, nibbling on the hedge – fortunately not the other hedge, which had laundry drying on it, quite usual. 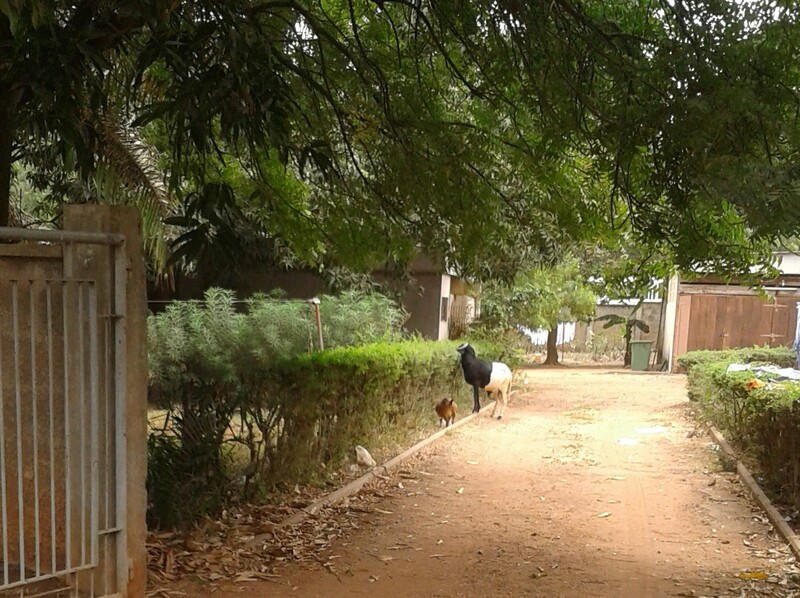 This is a nice area, with offices and embassies, but I was rather cheered up by these goats. Chickens are everywhere: underfoot, scratching in the dust, small chicks training the mother hen, but goats I have not seen so many of here in North Ridge. Accra is not an easy place to take street photos, but there are often wonderful moments of people and life happening, which I enjoy in the moment. Or in this case, two goats. 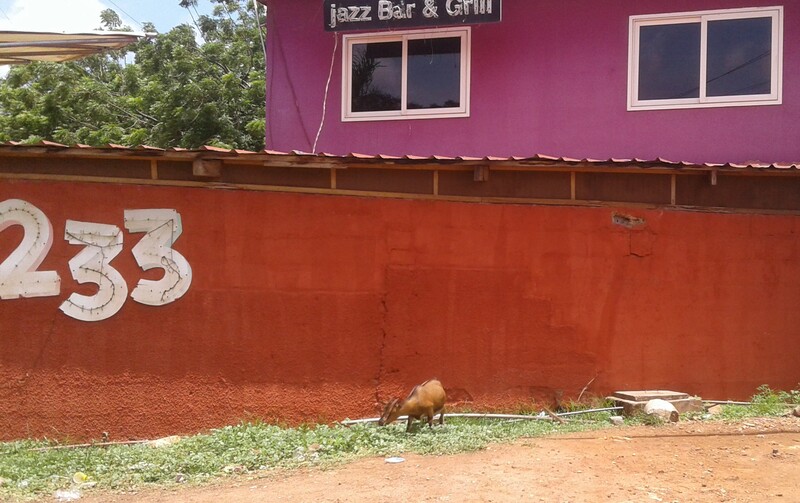 Here are goats in less green surroundings: these are in Kaneshie, snapped from a taxi window. Apologies for the blurriness. I keep seeing goats when I go to Melcom Plus in the North Industrial Area (electrical goods, furniture, household goods, and a surprisingly good selection of fresh Indian vegetables and Indian snacks.) Anyway, the goats are tethered by the roadside, with some hay but nothing much to graze on, so I think they are for sale. I’ve had some nice goat pepper soup here, but have not yet seen goat meat in the shops. I am told that Lara Mart in Osu has a good local butcher, possible goat meat source, to be explored. In the interim, I look at these goats, and wonder about the logistics of buying a live goat here. Growing up on a sheep farm, I am not squeamish about slaughter logistics, as long as it is done humanely and hygienically. Still, not something we will be trying, I am sure. Tofu and cabbage stir fry it is, then, not so Instagram-worthy but a nice change from chicken and rice. Wash the cabbage, onion and scallions well, and shake off excess water. Chop roughly. Cube the tofu, and slightly fry the tofu in a pan with hot oil, until crisp and slightly browned. Remove tofu from pan. Add cabbage, onion and scallions to hot pan with garlic, and sauté with a lid on top until the veg wilts and is slightly cooked. Dish up cooked veg on plates, top with warm tofu cubes, and add a splash of soy sauce. Sprinkle on some sesame seeds, if you like those. Notes: I made this again with bok choi and soy sauce-marinated tofu, very nice. I was thrilled when I found the Chinese store with good supplies of local greens, I really missed that after Rome’s piles of mystery greens (spinach, cicoria, bieta ..) I was equally horrified to later read about the prevalence of intestinal parasite eggs on vegetables in Accra (especially greens), due to watering with sewage-contaminated water. Oh well. The greens look good and taste great so far, so I continue to enjoy them. We wash them well, with food sterilising liquid, and never eat then raw, and I have bought de-worming tablets to take every three months, just in case, as recommended by a nurse. 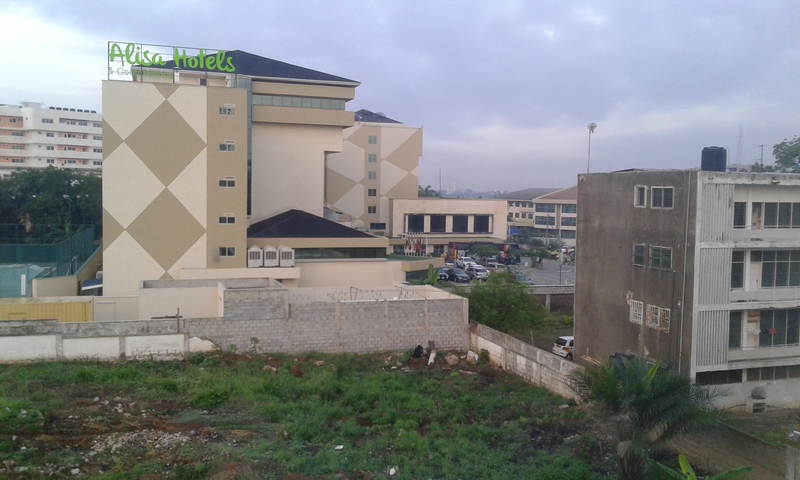 Oh, and see a recent post on “An African City” by That Gh Girl: “An African City: S2 E5- Got Goat Meat?” – according to that, Shoprite should have goat meat, but Makola Market might be the correct place to get it, though daunting. Series 1 of “An African City” is on YouTube, set in Accra, very entertaining, series 2 is pay access. This entry was posted in food, Ghana, travel and tagged goats, living in Accra, streetlife, tofu on March 12, 2016 by krumkaker. This is the flag of Ghana. From Wikipedia: “The red represents the blood of those who died in the country’s struggle for independence from the United Kingdom, the gold represents the mineral wealth of the country, the green symbolises the country’s rich forests and natural wealth, and the black star is the symbol of African emancipation.” Very interesting. Yesterday was March 6, Independence Day for the Republic of Ghana. Congratulations! The Gold Coast region declared independence from the United Kingdom on 6 March 1957 and established the nation of Ghana. After a massive electric storm Saturday night, rolling in from the Gulf of Guinea and lighting up the night sky for several hours, the weather is much better. We watched some of the the celebrations on TV, a national parade of school children and security services (by the look of it) at the Black Star Square. Very quiet in our part of town this weekend. We had a friend coming for lunch, so I made these bread rolls with sesame seeds. Electricity is so expensive, and as I was making an apple cake for dessert (following Toad in the Hole for lunch, since our friend wanted traditional British food), I thought I’d bake some crusty bread rolls at the same time, to take advantage of the oven being on. Mix ingredients to a smooth dough, cover and leave to rise. This might be 8-10 hours in a cool kitchen; here, it is 33C and humid, so I left it for just three hours and then continued. Tip out dough onto floured countertop, and divide it into two sausages of dough. Cut each sausage into six pieces, and shape into balls (equally sized, round or oval, shapes as you prefer), on a baking tray with baking parchment. Brush with water, and sprinkle with sesame seeds. Leave to rise another 15 minutes or so, while you heat oven to 200C, fan assisted. Bake 25 minutes or so, until they are nicely golden brown and sound hollow when tapped. Today is a holiday here and I am up in Akosombo, north of Accra. Even hotter here! We are cooling off in shade at a fancy hotel here before heading off to see the Akosombo dam. Reading about crime and dark freezing Norwegian winter in this Jon Nesbo book while sweating in the hot shade seems really strange. Nice to be out of town though, trip report to follow. This entry was posted in baking, food and tagged bread, living in Accra, rolls on March 7, 2016 by krumkaker.